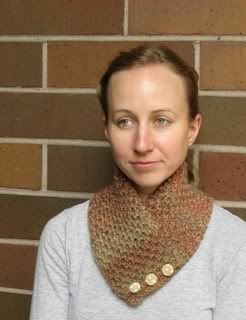 This little scarflet uses the twisted moss stitch for texture, warmth, and to make it squishably soft. Each Fidget takes only about 100 yards, so you can choose the softest, yummiest yarn you want and it will still be affordable. Choose any buttons, or make your own covered buttons out of unique fabrics. I’ve tested this pattern with three different yarns, but there are so many others that will work. Play around with it and make it yours. Difficulty: Just a smidge beyond beginner. 1 skein Cascade 128 (100% wool, 128 yards/100 grams, bulky weight) [Option 2]. Gauge doesn't matter enough to trouble with a gauge swatch. Please see the note about yarn substitution below. The Fidget measurements are flexible. You should make yours in the width and length that works best for you. The twisted moss stitch is incredibly stretchy, so I found that 23" inches long was perfect so my Fidget would stay cozy around my neck. The Fidgets you see here measure between 4.5" and 5.5" wide, but you can make yours in any width you would like, keeping in mind that you may have to adjust the number of stitches to cast on and the buttonhole placement if you are using a significantly different yarn. A note about yarn substitution: You can use any yarn you want to make your Fidget. A bulky-weight yarn such as those used for the originals would be easiest. If your yarn is significantly different, you will have to cast on a different number of stitches to achieve the right width. (If you are using a smaller yarn, you can knit with two strands held together to make it more like the yarns used in the pattern, and to make your knitting go faster). K1B: "knit one below": Insert right hand needle in stitch below next stitch on left hand needle and knit 1 into it, slipping the stitch above off needle at the same time without knitting it. Row 1(WS): Knit all sts. Row 2(RS): K2, *K1B, K1; repeat from * to last st, K1. Row 4: *K1, K1B; repeat from * to last st, K1. Repeat rows 1-4 until work measures 23 inches. End on Row 2 or 4. Next row (WS): Work Buttonholes as follows: *P2, yo, P2tog,* repeat between * 4 times, P1. Bind off all sts as to knit. Weave in ends. You might want to block your Fidget at this point. Although it doesn't curl nearly as much as stockinette, you can block out that bit of curl it does have. Twisted moss is a very flexible stitch, so make sure you block to the measurements, being careful to not stretch your Fidget out past 23" when you're laying it out to block. After blocking, fold fidget over as shown in picture to find button placement. Attach buttons. 1 skein Crystal Palace Yarns Kaya (100% wool; 65 yards/50 grams; bulky weight) . Skeins of Kaya are a bit smaller than Cascade, so you might have to stretch your work lengthwise a bit to achieve 23 inches. You essentially want to work until you are almost out of yarn but have enough remaining to do a couple more rows and attach the buttons. Follow pattern above except as specified to Buttonhole row. Next row (WS): Work Buttonholes as follows: P3, yo, P2tog, P2, yo, P2tog, P2, yo, P2tog, P2. 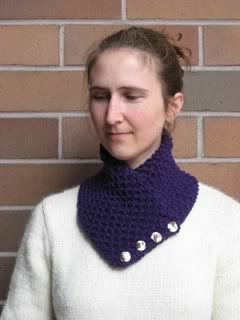 You can also cast on 13 stitches with this yarn and size 10 needles and follow the same pattern. Your buttonholes would then be as follows: P2, yo, P2tog, P2, yo, P2tog, P2, yo, P2tog, P1. For the Fidget pattern, please note that I did not invent the twisted moss stitch (also sometimes referred to as the rose stitch, and I'm sure it has other names as well), nor did I invent the "knit one below" concept. Before contacting me about the proper way to K1B, please do a bit of research online or in your favorite knitting reference book. I have found many good descriptions and diagrams of the stitch by typing "knit one below" into Google. 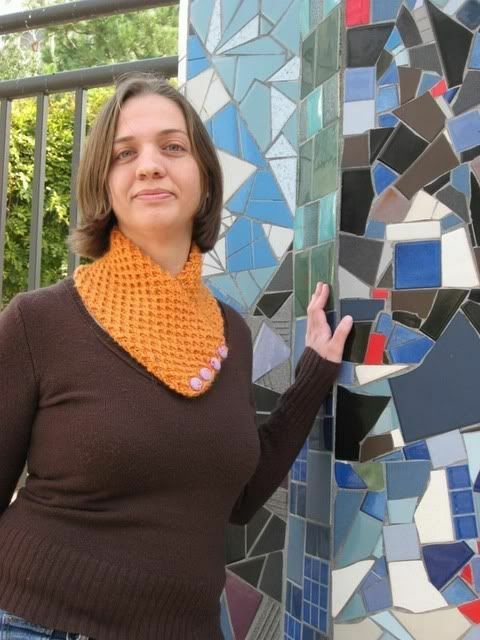 There is even a video of it on knittinghelp.com: http://www.knittinghelp.com/videos/knitting-glossary, but they call it "k-b." If you have done a bit of research, and you are still frustrated with it, then feel free to contact me.